The food and beverage processing industry have some very unique requirements for the flooring industry. Northern has formulations to withstand chemical and thermal attack. The use of cementitious urethane solves these problems. It also can be applied to low temperatures and over wet floors with a cure time of under 8 hours for foot traffic. Northern gets you up and running quickly, with a durable, chemical resistant, non-slip floor. Food manufactures, breweries, wineries, bottling plants, Dairy and cheese, egg processing facilities just to name a few all are subject to federal inspections. Their floors are just one aspect of these inspections, but also one of the most important parts! We use only the “BEST” Cementitious Urethane flooring materials, HACCP INTERNATIONAL certified antimicrobial cementitious urethane which is also ISO 22196 compliant. These standards and a set of key food safety criteria for potential physical, chemical and microbiological food safety risks, make these products the perfect choice for your environment. Our floors are heavy duty, antimicrobial and non-slip with a positively textured profile to minimize slip & fall risks and increased safety. For use in wet and dry food handling, processing and production areas. These floors protect against thermal shock, steam cleaning and moisture vapor transmission, all common causes of pre-mature floor failure. Resistant to temperature of up to 250ﹾF, and fully chemical resistant. 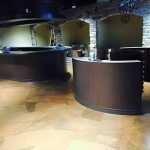 These floors work for the food and beverage industry. They can work for you!